"God is love, and he who abides in love abides in God, and God abides in him" (1 John 4:16) These words from the First Letter of John express with remarkable clarity the heart of the Christian faith: the Christian image of God and the resulting image of mankind and its destiny... I wish in my first Encyclical to speak of the love which God lavishes upon us and which we in turn must share with others." It should be read - and re-read - by every Catholic, indeed by all Christians. Unfortunately, too many Catholics do not feast on the gifts the Holy Spirit gives us through Christ's Church, such as this letter. They help us to grow closer to the Lord and make progress in our spiritual journey. Sometimes it is because we do not know they are available. Other times it is because we mistakenly believe such letters are "only for theologians" or might be too "intellectual". Sadly, when we make that mistake we miss out on a gift. The Holy Thursday Evening Mass of the Lord's Supper begins what is called the Triduum (Latin for three Holy days). In his message for the Chrism Mass in Rome in 2010 Pope Benedict reaffirmed the ancient understanding concerning these three days, saying that "...they could be considered one single day. They reveal the heart and are the key to both the liturgical year and the life of the Church." Last Sunday we celebrated Passion or Palm Sunday. Just prior to the reading of the Passion Narrative, we heard proclaimed one of the most ancient of the passages contained within the Sacred Scripture. St. Paul´s powerful words concerning Jesus´ self emptying, in Greek, His "kenosis". It is recorded in the second chapter of his letter to the Philippians. "Christ Jesus, though he was in the form of God, did not regard equality with God something to be grasped. Rather, he emptied himself." (Phil. 2:6-11) That self emptying is what Love is all about. In the words of the beloved disciple John "God is Love" and we are called to live in that kind of Love. We are called to pur ourselves out for one another. God so loved the world that He gave His only Son (John 3:16). The great mystery of the love given to us in and through Jesus Christ is what we will celebrate in the next few days. The Evening Mass of the Lord's Supper of Holy Thursday deepens our understanding of the self emptying love of Jesus Christ. On this day we celebrate the gift of the ministerial priesthood which continues to make present the Priesthood of Jesus Christ present in the Church in our own day. When the Priest stands at that altar,he stands in jesus Christ the High Priest. Christ is the Priest and the Victim. Jesus gave Himself to us and in the Eucharist he comes to reside within us. The Holy Sacrifice of the Mass is the Holy Oblation of Incarnate Love. When the Lord rose from that table, He showed us the naturally supernatural expression of Love; an expression that reveals the heart of the Christian vocation. He, who is Lord and Master, King of Kings, took off His Cloak of Royal Splendor and became a Servant. He washed the feet of those whom He had chosen to continue His Redemptive work. He showed them what they were chosen to do. Then, He enlisted them to live lives of self emptying Love for the world. To bear the name "Christian" is to walk in this love in the midst of a broken and wounded world that is waiting to be reborn.This is the same world which He still loves. It is being recreated anew as He continues His Mission through the Church, His Body, of which we are members. The early Christians spoke of the Church as the "new world" and the world in the process of being transfigured. We are a part of that Mystical Body of Christ, that Communion of Love called the Church. That Church still brings heaven to earth and earth to heaven. It is by coming to grasp this mystery - or rather be grasped by it - that we come to understand that Love is a verb. Our Priest, stands, to use the Latin phrase, "in persona Christi" (in the Person of Christ). He will rise and take the basin, towel and washcloth. Then he will wash the feet of twelve people chosen to symbolize the members of the Body of Christ, the Church. The Love of the Incarnate Word, the Second Person of the Blessed Trinity, is expressed in a symbolic action. Love is a verb. Love is a command, a mandate. The foot-washing is more than a re-enactment of an actual historic event; it is an invitation to participate in the ongoing redemptive mission of Jesus Christ by making it real. We do that by washing one another's feet. The Eucharist is the "Sacrament of Love", in the words of Benedict XVI. In that Encyclical letter he underscored the depth of the Mystery revealed in that penultimate Sacrament, and connected that Sacrament to our choice to live lives of sacrificial love in the world. That is what I mean by the expression Love is a verb. Foot washing expresses what living a Eucharistic Life, a life of self emptying love, is meant to look like. 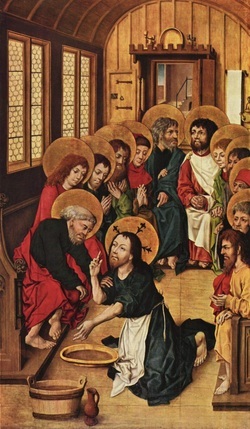 This Holy Thursday footwashing has been traditionally referred to as "the Mandatum", the Command. It is a command to become a man or woman poured out for others. Through our participation in the Mysteries of these three Holy days, this one day; we encounter the Lord. In that encounter He calls us afresh to follow Him and to make Him present for others. In order to truly be a Christian - it helps us to remember what names mean in the biblical sense. They communicate identity. We bear the name of Christ. Through grace we are capacitated to become a manifestation of the self emptying love of Jesus the Christ in our daily lives. In his encyclical, Pope Benedict wrote of an inner dynamic which happens when we participate in the Eucharist: "The Eucharist draws us into Jesus' act of self-oblation. More than just statically receiving the incarnate Logos, we enter into the very dynamic of his self-giving. "Union with Christ is also union with all those to whom he gives himself. I cannot possess Christ just for myself; I can belong to him only in union with all those who have become, or who will become, his own." "Communion draws me out of myself towards him, and thus also towards unity with all Christians. We become "one body", completely joined in a single existence. Love of God and love of neighbor are now truly united: God incarnate draws us all to himself...."
"So, during supper, fully aware that the Father had put everything into his power and that he had come from God and was returning to God, he rose from supper and took off his outer garments. He took a towel and tied it around his waist. Then he poured water into a basin and began to wash the disciples' feet and dry them with the towel around his waist." Here, in this poignant scene we encounter Jesus the Servant. After He washes feet, he shares a final meal with his closest friends. All of this before He would suffer and freely stretch out His sacred arms to embrace the entire world and join heaven to earth, showing the depth and substance of true love. During the Supper, Jesus inaugurates the holy exchange, the Eucharist. 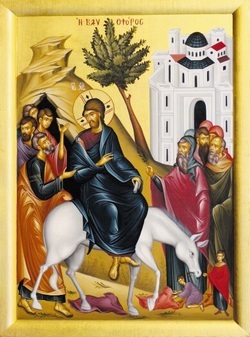 He gives Himself as food for those who will make the journey with Him back to the Father and then sends them out to bring the whole world with them, by continuing His mission. The next day He walks the way of suffering and mounts the altar of sacrifice on Golgotha's Hill to fully pour Himself out - every last drop of blood and water flowing from His wounded side - for us all. 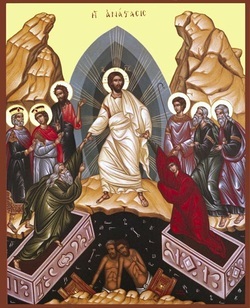 Through His death and Resurrection he begins creation anew, overcomes the power of sin, pays the debt of justice and defeats the devil and the last enemy death. As we enter into these three days, the one day, we make this mystery our own. No mere spectators in this Act of Love we become participants. We who bear the name "Christian" are to pick up that basin and towel, to climb upon that Cross and learn to live the Way of Love in service. Our faith and love are to be active and incarnate. We live in the One who continues to love through us. Jesus washes his disciples feet, using our hands. We make the mystery real in a world that awaits the fullness of redemption. God is Love and Love is a Verb. 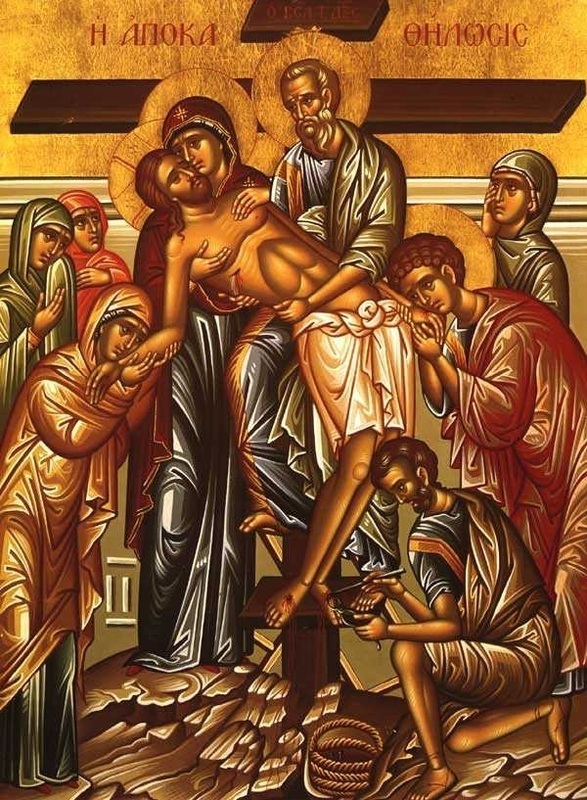 Three times during Holy Week the Passion is read - on Passion Sunday, Holy Thursday, and Good Friday. By very ancient tradition, three clergy read the three principal parts from the sanctuary: Jesus (always read by a priest), Narrator, and all the other individual parts. The people also have a role in this - we are those who condemn the Lord to death. Hearing our own voices say 'Away with Him! Crucify him!' heightens our consciousness of our complicity by our personal sinfulness in causing His death. Looking at the Cross in prayer helps us to truly see it. Most Christians have crosses in their homes. Many wear a cross around their necks. Some of these are very beautiful, perhaps made of precious metal and embellished with jewels. The beauty of these devotional objects may emphasize the glory and the victory of Our Lord's Cross; but too often representations of this central symbol of our faith are regarded primarily as decorative, and its true message is lost. It is fitting that Christians glorify the Cross as a sign of Christ's resurrection and victory over sin and death, of course. 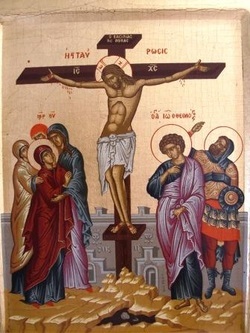 But we should remember each time we see a cross that the Cross of Jesus' crucifixion was an emblem of physical anguish and personal defilement, not triumph-of debasement and humiliation, not glory-of degradation and shame, not beauty. It was a means of execution, like a gallows or a gas chamber. What the Son of God endured for us was the depth of ugliness and humiliation. We need to be reminded of the tremendous personal cost of love. As Lent advances we contemplate the redeeming Mystery of the Cross which aids the Church in her pursuit of the renewal of the faithful. The image of the Cross may help each of us to learn more fully the meaning of Christ's sacrifice, and how we are to imitate His example. We can hope that our prayers which focus on the Crucifixion of our Lord will help atone for our own sins and the many grave sins of our society. The Sign of the CrossThe season of Lent is a most appropriate time for children of all ages to learn more about one of the most distinctively Catholic prayers: the sign of the cross. It is a visible sign (a sacramental) of one's belief in Christ and of one's hope in the redemption which flows from His Cross. Accompanied by the invocation of the Trinity (Doxology), 'In the name of the Father, and of the Son, and of the Holy Spirit', making a sign of the cross is a simple and beautiful form of Christian devotion. By making this sign both in public and in private we affirm our faith in Christ crucified and ask for His blessing and protection. It is also a gesture of reverence to the Blessed Sacrament. This Christian sign is a very ancient one, mentioned by the early Fathers of the Church as being a habitual practice by the second century. Tertullian recounts that 'in all our travels in all our coming in and going out, in putting on our shoes, at the bath, at the table, we mark our foreheads with the sign of the cross.' This sign or mark on the forehead of consecration to Christ has an antecedent in Ezekiel's prophetic vision of judgment, in which the Lord commands that a 'mark be set upon the foreheads' of the Israelites who cry out against the evil which surrounds them, so that by this mark God's people were identified as belonging to Him and saved from annihilation (Ezekiel: 9:4-6). Other biblical references to 'sealing' God's people with a sign on their heads are found in the Apocalypse (or Revelations) 7:4, 9:4. This sacramental 'mark' is important to Catholic people to this day. We are anointed, at baptism and at confirmation, by the priest making the sign of the cross on our foreheads with the Oil of Chrism (the oil blessed by bishops at the Mass of Chrism on Holy Thursday). The sign and the chrism are is also used at the ordination of a priest or bishop. In administering the sacrament of the sick the priest anoints the person with the sign of the cross made with blessed oil. Also, on Ash Wednesday, our foreheads are marked by the priest with the sign of the cross made with blessed palm ashes. DIRECTIONSAlthough celebrated Holy Saturday evening, it is the dramatic Easter vigil liturgy that marks the beginning of Easter. We are awaiting our master's return with our lamps full and burning, so that he will find us awake and seat us at his table (cf. Luke 12:35ff). All Catholics should try to attend this beautiful service. The vigil is divided into four parts: 1) service of light, 2) liturgy of the Word, 3) liturgy of Baptism, and 4) liturgy of the Eucharist. The candle is then processed through the church, with the deacon lifting the candle at three different times, singing: Christ our light (Lumen Christi) and the congregation sings in reply: Thanks be to God (Deo gratias). Everyone lights their candle from the Easter candle and continue in procession until the whole church is alight. The Paschal candle symbolizes Christ, the Light of the World. Exsultet (excerpts) Rejoice, heavenly powers! Sing choirs of angels! Exult, all creation around God's throne! 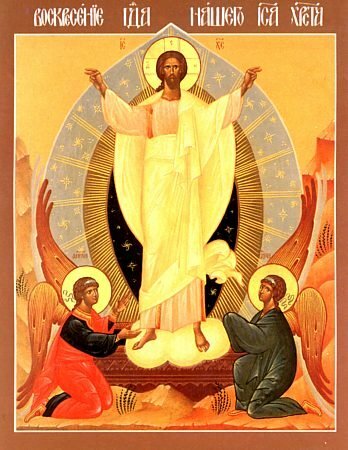 Jesus Christ, our King is risen! Sound the trumpet of salvation! This is night, when Christians everywhere, washed clean of sin and freed from all defilement, are restored to grace and grow together in holiness. May the Morning Star which never sets find this flame still burning: Christ, that Morning Star, who came back from the dead, and shed his peaceful light on all mankind, your Son, who lives and reigns for ever and ever. R. Amen. For more information about this Easter song please see The Exsultant from the Catholic Culture Library. During the Easter vigil, nine readings, seven Old Testament and two New Testament, are provided. Not all are required to be read due to time constraints, but at least three Old Testament readings must be read, including Exodus 14. These readings help us meditate on the wonderful works of God for his people since the beginning of time. The readings are 1) the story of creation, Gen 1:1-2; 2; 2) Abraham and Isaac, Gen 22:1-18; 3) Crossing of the Red Sea, Exodus 14:15–15:1; 4) Isaiah 54:5-14; 5) Isaiah 55:1-11; 6) Baruch 3:9-15.32–4:4; 7) Ezekiel 36:16-17.18-28; 8) Romans 6:3-11; and 9) Gospel reading Mark 16:1-7. The Gloria is sung before the reading of the Epistle of the Romans, and the Alleluia is sung before the Gospel. During this time the Easter water is blessed, new members are brought into the Church through baptism, and the faithful are blessed with water and renew their baptismal promises. V. The Mass is ended, go in peace, alleluia, alleluia. R. Thanks be to God, alleluia, alleluia.